As the temperatures rise, try and give your bedding a refresh just like you swap your winter clothes for summer ones. 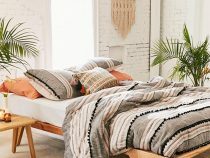 Switching your heavy duvet for a lighter one might be obvious; however some items might not be like how and when to wash your bedding and when to rotate your mattress; may not be as well known. Below are some tips to help build the summer bed of your dreams. The first thing you do is change your heavier duvet to a light comfortable one. This can be done from around Easter and keep it until it gets a little bit cooler, may September or October. If you are a warm sleeper maybe forget about the comfort during the warmer months of the year and use a light sheet over your top sheet. If you are the opposite sleeper try and look for a duvet of about 500 or below. If you decide to go with the light sheet, make sure keep your duvet folded at the bottom of your bed or store it away in a breathable cotton storage bag. If you store it in a non-breathable cotton bag, mildew may form in the feathers. In the warmer months use light, natural materials like linen and cotton. Store away your flannel sheets for the cooler season and stay away from synthetic materials as they don’t breathe as well. As the temperatures get hotter, it would be a good idea to wash your linen more regularly than you would during autumn and winter. Try and wash your sheets and pillow cases weekly and make sure to have a spare set while changing. Wash them in warm water, )not hot) as it can shrink the fibres, tumble dry and take them out before they are totally dry and lay them out on the bed. Doing your linen this way will prevent them from creasing. The summer season is the perfect time to give your entire bed a once-over. Your pillows should be washed at least twice a year (make sure to see tag for instructions) or just replace them if they really need it. It may be a good idea to use pillow protector; this will extend the life of them but wash them every couple of weeks. Rotate your mattress at least twice a year. Following the above tips should help with more comfortable cleaner bed and ensure you have a nice and cooler sleep during the summer months. Sweet dreams!